When Georgia based Tyler Hubbard and Florida based Brian Kelly joined hands to launch their music under the title 'Florida Georgia Line’, they created one of the recent times’ biggest country hit single, ‘Cruise’. The duo is now out on the road to present a series of music concerts, as part of their latest tour. Grab your Florida Georgia Line tickets and watch one of the most famous country music duos live in concert. Hubbard and Kelly met during their days at Nashville’s Belmont University. They musicians bonded over a common love for guitar playing. Soon, they began writing songs during the time between classes. The two played as a local club band and gained a considerable amount of fan following within the Southeast club circuit. With a sharp and fresh country sound, the band produced a six track EP ‘Anything Like Me’ in the year 2010. The collection was produced by FGL and Wesley Walker. The EP has writing credentials of the musicians on almost all compositions. Its tracks include ‘Man I am today’, ‘Never Let Her Go’, ‘Now That She’s Gone’, ‘You’re Country’ and ‘Back Tears’. The latter was re-recorded by the popular music star, Jason Aldean and featured in his Gold certified album ‘Night Train’. The second EP ‘It’s Just What We Do’ includes a total of five singles. It was produced by Joey Moi and released under Big Loud Mountain Records in May of 2012. The EP begins with the single ‘Cruise’ and then goes on to present numbers like ‘Get Your Shine On’, ‘Tell Me How You Like It’, Tip It Back’ and the title song ‘It’s Just What We Do’. Before reaching the Country Music charts, single ‘Cruise’ had already gained immense popularity on the public level. This is because the musicians did not wait for a renowned record label to sign them in a grand style. Rather they worked hard to create their following by carrying out several concerts at various venues. Thus, before the release of their first studio album in 2012, fans were already familiar with who Florida Georgia Line is and what their music represents. When they did in fact land in a deal with the renowned recording label Republic Nashville, it was cherry on top for the band that already had fans running for their autographs. With the release of their first studio album ‘Here’s to the Good Times’, the single Cruise became a Platinum selling, number one hit. The song is also the most apt introduction to the collection which serves as an ideal play for a summer music party. The title track ‘Here’s to the Good Times’ has a celebratory feel to it and can be readily featured in a beer commercial. ‘Hell Raisin’ Heat of Summer’ contains an element of nostalgia as the duo shares their sweet old summertime memories. The heart beat like percussion adds a unique and catchy touch to the melody. The laid back track ‘Round here’ is a great fit for the country radio. The only single that does not have a ‘party vide’ is ‘Stay’, the cover of a Black Stone Cheery number. It is a love song with strong emotional lyrics. However, it still carries a lot of tempo and some admirable mandolin and steel guitar work. The duo has done a commendable job in creating a unique country rock version of the composition. From start till the end, ‘Here’s to the Good Times’ is overall a fun filled peppy album with lots of sing-along happy songs that are based on summer energy, beer shots, road trips, romantic fantasies and much more. It has been received very well both commercially and critically. Blending the 90s grunge sound with country is not a new experiment for music artists. However, the duo does this well enough to make their music look appealing and increasingly addictive. Florida Georgia Line have hit the road with their Anything Goes Tour, in support of their sophomore record “Anything Goes”. Recently certified platinum, the album has topped the Billboard charts and spawned hits like Dirt and Sun Daze. The bro country duo has been packing venues ever since their tour started in January. Expected to wrap up in October, Fgl 2019 tickets for the remaining shows are in great demand. As soon as Tyler Hubbard and Brian Kelley take the stage, they Cruise into the performance and remind the crowd throughout the show that This Is How We Roll. The duo’s pseudo rock ballads will keep you grooving till the end of the concert. So if you want to watch the live performance of country music’s rising stars, then get your hands on Florida Georgia Line concert tickets. Florida Georgia Line will hit the road in 2017 continuing with its Dig Your Roots Tour that gave several sold out shows in 2016. The country duo has announced 28 more cities for the 2017 trek that kicked off in January. Tyler Hubbard and Brian Kelley are excited to get off with the new string of shows and they are particularly excited to have Dustin Lynch and Chris Lane along. They think the fans will love the new experience so get Florida Georgia Line tour 2019 tickets and see the young performers as they bring their music to Pennsylvania, New Jersey, West Virginia, Florida and more cities. The demand for FGL tickets has risen by leaps and bounds recently. This is due to the announcement of the duo’s Can’t Say I Ain’t Country Tour. The outing is in support of the band’s fourth studio album of the same name. Tyler Hubbard and Brian Kelley will kick off the trek in June and it will hit numerous cities before wrapping up in Irvine, California in September, 2019. Joining the duo on the road for this run are Dan+ Shay and their Up Down collaborator and country music artist Morgan Wallen. While these two are the main support acts, Hardy and Canaan Smith will also be performing as part of the tour on select dates. The song Simple from the new album has already become a number one hit. Besides the duo has released the track Talk You Out of It to country radio and also shared Colorado online. They have recently earned a Grammy nomination for their collaboration with singer Bebe Rexha on the song Meant to Be. Florida Georgia Line delivered exciting news to their fans recently by announcing that they will be adding not one but three stadium shows to their, ‘Smooth Tour.’ Moreover, the recipient of Academy of Country Music Awards revealed that they will be joined by none other than the famous pop group, Backstreet Boys. FGL will play their first stadium show at Boston’s Fenway Park on July 7th. The duo will then perform the second and third stadium shows on July 29th and August 12th at the Target Field and the Wrigley Field respectively. The ACMA winning country duo, Florida Georgia Line will be heading out on, ‘The Smooth Tour’ in the summer of 2017 with supporting acts, Nelly and Chris Lane. Nelly and FGL have performed music together back in 2014 and have also churned out a single titled, Cruise (Remix). Chris Lane however is an upcoming country singer who released his album, ‘Girl Problems’ last year in 2016. Florida Georgia Line has revealed their tour dates and they are scheduled to play their first show on June 2nd at the Austin360 Amphitheater. Their trek will conclude in October. Nothing beats the joy of watching your favorite music artist perform live! Florida Georgia Line's concert dates are out and fans are looking forward to the upcoming shows. The next concert will be held in Austin at the Frank Erwin Center on 4-May-19, while the last available date is for the event scheduled for Irvine at the FivePoint Amphitheatre on 28-Sep-19. For complete information regarding dates and venues, please visit our website. The average price for Florida Georgia Line Tickets start from $92. The minimum get in price is $16 for Florida Georgia Line Tickets at the BankPlus Amphitheatre, Southaven. For a detailed look at ticket prices and amazing discounts, visit our website. Q:What is the cost of Florida Georgia Line tickets for their show in Paso Robles? A:The bona fide hit makers behind number-one singles like, Cruise and Stay, Florida Georgia Line are scheduled to take their tour to Paso Robles on July 18, 2018. 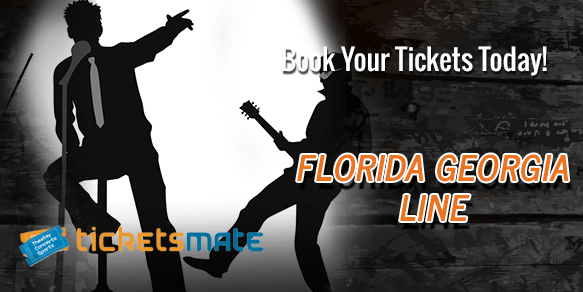 So, to watch them hit the stage at the California Mid-State Fair Grounds, simply purchase your Florida Georgia Line tickets from our certified brokers who are currently selling them at an average price of $132. Q:Are Florida Georgia Line tickets currently available? A:Yes, Florida Georgia Line tickets are available for sale. You can avail the most suitable deals by going through the vast inventory on our website. The sooner you purchase the tickets the better as prices are likely to go up as the concert dates draw close. Q:Can I refund my Florida Georgia Line tickets? A:Our website has a no refund, no exchange policy. That said, refund option is available in case of some special circumstances such as the event being cancelled or postponed. For further details please go through the policies page of our website or contact our customer services representative. Q:Do you have Florida Georgia Line tickets for their show in Milwaukee? A:Florida Georgia Line is scheduled to perform their show in Milwaukee at the American Family Insurance Amphitheater on June 30, 2018. We do have Florida Georgia Line tickets for that show so, if you are interested in buying them then do so by visiting the relevant event’s page of our website today. Q:How many florida georgia line concert tickets can I buy online? A:You can buy as many Florida Georgia Line Tickets from our brokers as you want, there are no restrictions in that regard. Q:Where can I find information about florida georgia line tour dates? A:Log on to our website to get all the details you need about Florida Georgia Line Tickets and the tour's dates. Please note that the tickets and their prices you see on our website have been put up there by our registered brokers. Q:Have the florida georgia line tour dates 2018 been finalized as yet? A:Not only have the dates been finalized but Florida Georgia Line Tickets are also now available for you to buy. You can get them from our registered brokers through our website and that too in just a matter of a few minutes. Q:How can I pay for georgia florida line concert tickets? A:The country music duo has charted on Billboard's Top Country Charts and has opened for well known singers like Luke Bryan, Jake Owen and Brantley Gilbert. You can pay for Florida Georgia Line Tickets via credit cards. Please note that we do not accept payments made by cash. Q:How can I pay for florida georga line tickets? A:It has just been four years since the country music duo started to make mainstream music and now they have already opened for well known artists like Luke Bryan, Jake Owen and Brantely Gilbert. Due to security concerns, you can pay for Florida Georgia Line Tickets only by credit card. Cash is not accepted. Q:Can I have my florida georgia line tour 2018 tickets delivered to another address than the one mentioned on my card details? A:As per our agreement with card companies your Florida Georgia Line Tickets can only be delivered to the address mentioned on your card details. Q:When will I get my florida georgia line tour tickets? A:Your Florida Georgia Line Tickets will be delivered as per the time conveyed when you booked them. Q:Where will you deliver my florida georgia line tickets? A:Your Florida Georgia Line Tickets will be delivered to the address mentioned on your card details.